The ideas brought from academic research into public discussion by these principals are supplemented by others on the Links/Tools and Articles pages. 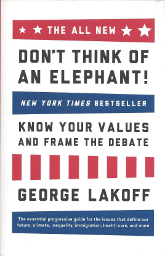 2008: One of the world 's best-known linguists and cognitive scientists, George Lakoff has a knack for making science make sense for general readers. 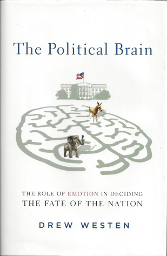 In his new book, Lakoff spells out what cognitive science has discovered about reason, and reveals that human reason is far more interesting than we thought it was. Reason is physical, mostly unconscious, metaphorical, emotion-laden, and tied to empathy-and there are biological explanations behind our moral and political thought processes. His call for a New Enlightenment is a bold and striking challenge to the cherished beliefs not only of philosophers, but of pundits, pollsters, and political leaders. 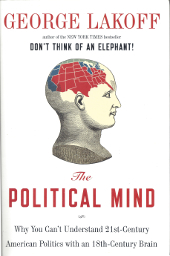 The Political Mind is a passionate, erudite, and groundbreaking book that will appeal to anyone interested in how the mind works and how we function socially and politically. 2012: "Voters cast their ballots for what they believe is right, for the things that make moral sense. Yet Democrats have too often failed to use language linking their moral values with their policies. 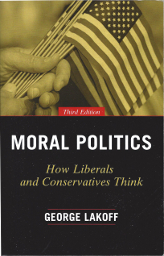 2016 (3rd Edition): When Moral Politics was first published, it redefined, through the lens of the brain and cognitive sciences, the largely unconscious basis of the political divide in America. Politics is about morality. Our deepest moral worldviews define our identities, and we vote based on our identities more than on our interests. When confronted with facts that don' fit our moral views, our brains automatically and unconsciously ignore or reject the facts. Idealized family values—nurturant parent family values and strict father family values—define different versions of morality, pitting progressives against conservatives on almosst all major issues and giving rise to opposing versions of political ideas, from freedom to responsibility to markets. There is no political middle, no ideology held by all moderates. Public political discourse, not conversant with the brain and cognitive sciences, leaves out all of this. 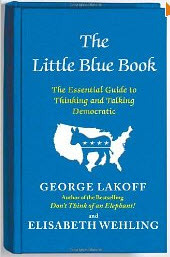 For this new edition, George Lakoff has extended his observations to major ideological conflicts since the book's original publication, from the Affordable Care Act to the wars in Iraq and Afghanistan, the recent financial crisis, and the effects of global warming. The Shock Doctrine: The Rise of Disaster Capitalism, by Naomi Klein, was published in 2007. To understand the ultimate goals of laissez-faire capitalism (capitalism with no rules, distinct from the regulated capitalism in the U.S.), the damage inflicted internationally where it has been imposed, and its fundamental conflict with democracy, read comments on the book here, then read the book.